In today’s era of digital transformation, time-to-market is the new name of the game, and DevOps is changing the way software is built. As developers have taken on a much larger role in the software development lifecycle, including developing secure code, building containers and ensuring quality, security cannot be separated from DevOps and engineering. Unfortunately, traditional software security testing tools have operated in isolation and have forced developers to change the way they work. Checkmarx, however, has developed a more agile and responsive solution: Checkmarx’ Software Exposure Platform. Taking a holistic, platform-centric approach, the platform builds security in from the beginning, supporting all stages of the software development lifecycle, allowing enterprises to deliver secure software at the speed of DevOps while mitigating their business risk. 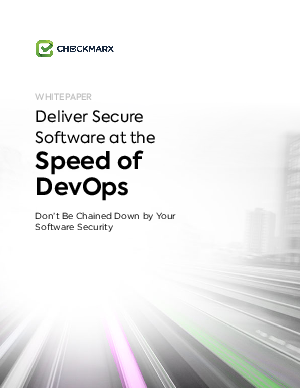 Download the white paper Delivering Secure Software at the Speed of DevOps to learn how Checkmarx provides the combination of integrations and automation required in fast-paced development environments to empower development and security teams to improve the overall security posture of their organizations.